You might not have heard of of rhum agricole, but if you’re a rum lover, you probably should have. Agricole, which is traditionally made in countries that were formerly French colonies, is made from pure sugar cane juice, while most rums are made from distilled molasses. Using fresh sugar cane juice is a more expensive process. Unlike molasses, which can be created anytime, rhum agricole can be made only when the sugar cane crop is at the peak of maturity, meaning it is limited to a short period of time each year. After harvesting the sugar cane, it is naturally fermented into wine over a few days, before being distilled into agricole rum. Rhum Clément Premiere Canne is such a rhum agricole. Made in Martinique, the white rum is a crisp, delicate spirit that sells for around $30 per bottle. Clément Premiere Canne has a nose unlike any other rum I’ve tasted. Grass, vanilla bean, melon, and citrus are all apparent. On the palate, it is smooth and tastes much like it smells: sweet sugar cane, cantelope, and lemon. The finish is long with vanilla and plenty more sugary sweetness. I enjoyed the Rhum Clément on the rocks, but I think it it really shines in a cocktail. The refreshing flavors made for an excellent mojito with very little simple syrup needed. 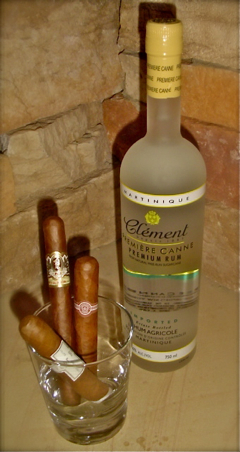 As for cigars, Clément Premiere Canne requires a delicate touch. Stick to mild cigars like the Cuban Crafters Medina 1959, Ashton Classic, or a Cuban Por Larrañaga Panetela. Ultimately, Rhum Clément Premiere Canne is not a classic sipping rum. At first I had mixed feelings about this spirit, even thinking that it reminded me more of a fine tequila than a rum. After a few nights of sipping it, though, I’ve come to thoroughly enjoy its unique nectar-like qualities. So if you’re a rum drinker looking to expand your horizons, I can confidently recommend Rhum Clément Premiere Canne. Doesn't look like it's available through the VA ABC, but $30 is way too much for a mixer anyways.